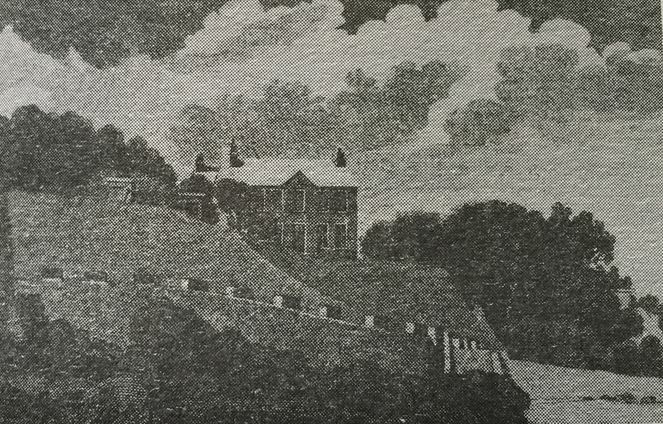 Vauxhall Gardens as depicted in The Sentimental and Masonic Magazine, August 1793.
the house became known as Fort Lisle. ‘nobility and gentry’ subject to an admittance charge of one British sixpence. properties, Fort Lisle and Elm Cliff both present on the site. which offered a classical and general education with the added health benefits of the sea air. her daughters opened Elm Cliff Boarding House in 1836 and continued in business until 1865.
to a larger site nearby. salvaged material was auctioned on the site by Blackrock auctioneer John Hazley. AREA Valuation records locate the property on Intake Road in the parish of Booterstown. Map Location Roe maps of the Fitzwilliam Estate 1774 and 1794; OSI Historic Maps 1837-42. VALUATION Valued at £58:5s in 1849 with the gate-lodge separately valued at £4. acres of pleasure gardens with a rivulet of fresh water and a secluded bathing place. Merrion Ave. was included as part of the demesne. 1750 - 1757 William Medcalf. 1757 - 1765 James and Mary Henry. in the company of her brother Admiral Matthew Moore. Property named Fort Lisle. 1789 - 1792 Mrs Grace Travers. 1793 - 1804 Thomas Mayne & Co. renamed Vauxhall Gardens and opened as a Hotel and Tavern. 1804 - 1823 Seasonal lettings. 1824 - 1826 Miss Mary Malone, Boarding House. 1826 Miss Nolan recorded occupier Tithe Applotment Books. 1830 Blackrock Boarding and Day School headmaster James Prendeville. 1835 Dublin and Kingstown Railway Company. 1836 - 1857 Mrs Maria Grace opened Elm-Cliff formerly Fort Lisle as a boarding house. with John D’Alton co-wrote The History of Dundalk. 1865 - 1870 Major Richard Pepper. 1879 Grounds of Elm-Cliff incorporated into the People’s Park. 1824 James King – general servant at Fort Lisle boarding house. 1847 Peter Murray occupied the gate lodge. 1865 Margaret Neilan – cook at Elm-Cliff boarding house. Current Status No longer extant.